Lora Rossi of Ardmore, Montgomery County, suffers from a chronic pain condition called Complex Regional Pain Syndrome (CRPS), and spends pretty much all of her non-working hours in bed due to the debilitating pain. “I am definitely not the same person I was before,” she says. In 2007, Lora Rossi was a typical 28-year-old, always on the go, helping others as a director in a non-profit organization or having fun with friends and family. Her life though soon took a painful twist when after ankle surgery she developed Complex Regional Pain Syndrome (CRPS). A chronic condition, it is primarily characterized by burning pain that starts in one of the limbs after an injury or trauma, but that can spread to the whole body. Tenderness to touch, swelling and changes in temperature of skin, hair and nails are often experienced as well. Sometimes the pain develops without a noticeable injury or trauma. Enrique Aradillas, a neurologist with the Vincera Institute in Philadelphia, likens pain level to the volume on a stereo. “Normally, when we get hurt, our pain level rises, but eventually comes back down again as the damage heals. With CRPS, however, the volume remains elevated and any other further injury or trauma can exacerbate the pain,” he explained. For Rossi, the pain she felt after reconstructive surgery on her left ankle intensified instead of gradually diminishing. 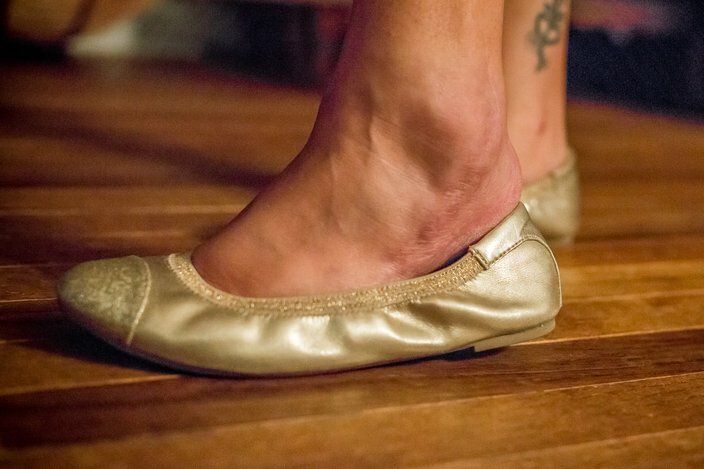 On an average day, she feels constant pain in her left leg from the tip of her toes to 8 inches above her knee. She described it as vacillating between a burning pain – like being branded with a hot iron, she said – to the feeling of pins and needles. “My leg will swell up to twice the size of my other leg and I often find black and blue marks and cuts and I have no idea where they came from,” she said. 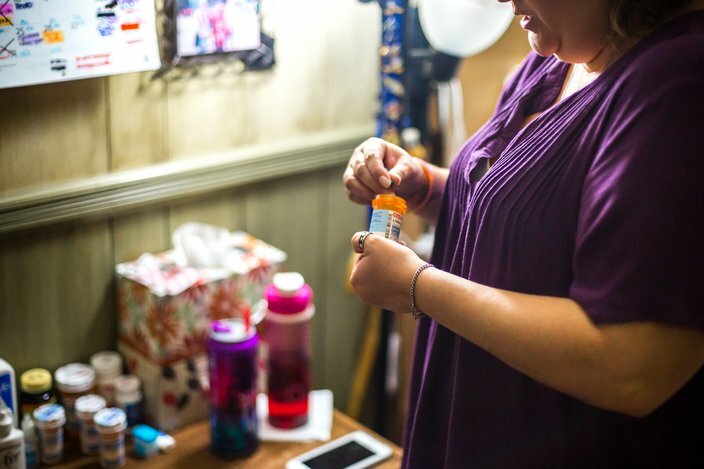 She ended up seeing several different doctors before getting the right diagnosis, and even then, treatment has been a delicate balancing act of searching for the right combination of medication and therapies to keep the pain manageable. Lora Rossi needs 37 pills to help her through the day. But the side effects keeps her from taking all of that medication, leaving her no choice but to deal with extreme pain. Doctors have been aware of the neurological condition since the Civil War era. Silas Weir Mitchell, considered the founding father of neurology, studied nerve wounds and their treatment while working at the Turners Lane Hospital in Philadelphia during the war. Later he was appointed to the Philadelphia Orthopedic Hospital for Nervous Diseases. He used the term causalgia – the Greek term for burning pain – to describe the condition initially and later John Bonica, the founding father of the study of pain management and founding director of Washington University’s pain clinic, renamed it Reflex Sympathetic Dystrophy (RSD). In 1993, when there was a better understanding of the mechanism of the disease, the name was again changed – to Chronic Regional Pain Syndrome. According to Aradillas, the underlying mechanism was thought to be the malfunctioning of the sympathetic nervous system (fight-or-flight response) and central nervous systems (brain, spinal cord and the peripheral nerves that run throughout the body), but now research suggests the immune system is also involved. “An important question to ask is why all people with limb injury or trauma don’t develop this condition,” said Ashwini Sharan a neurosurgeon at Thomas Jefferson University Hospital who treats Rossi. “However, we have been implanting spinal cord stimulators successfully for years to blockade the pain problem experienced in these patients .... Just this year, we have started implanting a new FDA-approved systems for implantation on the Dorsal Root Ganglion – and this is providing even more pain relief for CRPS." Despite all the progress, too little is known about CRPS and how best to treat it. According to Dajie Wang, a specialist in anesthesiology and pain management at Thomas Jefferson University Hospital who also treats Rossi, the biggest challenges of CRPS are diagnosis and treatment. He said the number of patients diagnosed is still relatively small. Wang said the current treatment protocol is multidisciplinary, using a combination of medication, neurosurgery, physical therapy and psychology to manage the ever-present pain. There is no cure. “Not using the affected limb will lead to muscle loss and restriction of joint mobility so physical therapy and rehabilitation are very important,” he added. The challenge both Wang and Sharan acknowledge is that for many patients, like Rossi, the pain is so severe that keeping mobile and exercising is beyond difficult. Lora Rossi, 38, moved into the basement of her parent's home after the operation, allowing her mother to provide her with much-needed care. Rossi's CRPS is so severe that physical therapy is not an option. Instead she relies on a constant stream of pain medication and spinal block injections to manage her daily pain. Eight years ago, she also had a spinal cord stimulator implanted near the spine. Similar to a cardiac pacemaker, electrodes from the device either block the pain signal from getting to the brain or replaces it with a different signal, Sharan explained. Even with the spinal cord stimulator though, Rossi’s pain is still about 90 percent, and she worries a lot about what all this medicine is doing to her stomach, liver and kidneys. “I can walk now, which is better than other people I know, but I have lost so much at an early age,” she said. The constant pain and the time needed for doctor appointments and treatments forced Rossi to leave a job she loved and has curtailed her once-active social life. She currently works as a temp at an apartment complex. "By the time I get home from work, I am in such pain that I can barely move or even stand,” she said. “Before the ankle surgery, I loved spending long summer days down the shore, hanging out on the beach and walking the boardwalk," she added. "Now though, even just a walk to the beach can be very taxing on my body and if I want to hang out with friends, I need to stay at home and rest all day first." A shoe lover, Rossi's closet was once filled with all different styles of heels. Now it's flats only. “My parents’ lives have been affected as well,” she said. "Because I can’t lift or carry anything and even getting out of the tub is difficult, my mom does things for me that you wouldn’t think she would have to at my age. “At 38 years old, my mother has to help me shower at times, dress me or dry me off. She will bring my meals to me in bed to make sure I eat. She comes to every doctor’s appointment and helps me keep track of instructions and medications." A scar on Lora Rossi's ankle shows the site of her surgery. Rossi is hoping that a new treatment, ketamine infusions, will change her life. She recently met with Aradillas to discuss her options. Ketamine, an N-methyl-d-aspartate (NMDA) receptor antagonist, blocks the influx of calcium that fires up the pain transmission neurons in the central nervous system, reversing the sensitization process and allowing the nerve cells time to heal. At the Vincera Institute, Aradillas administers ketamine in two ways: outpatient for four hours or as 24-hour continuous infusions during a five-day hospital stay at Hahnemann University Hospital. Because of side effects like hallucinations and increased blood pressure and heart rate during the infusions, patients must submit beforehand to neuropsychology and cardiology evaluations and are closely monitored during the treatment. The concern with ketamine treatments, according to Sharan, is that it is still considered experimental and there is no proper protocol. Everyone has their own way of doing it, and it is not clear who gets the best results, he said. Connie McMenamin, an Aradillas patient, swears by ketamine treatments. Besides medications and injections, she goes for outpatient treatment every two months and inpatient treatment every 6 months. 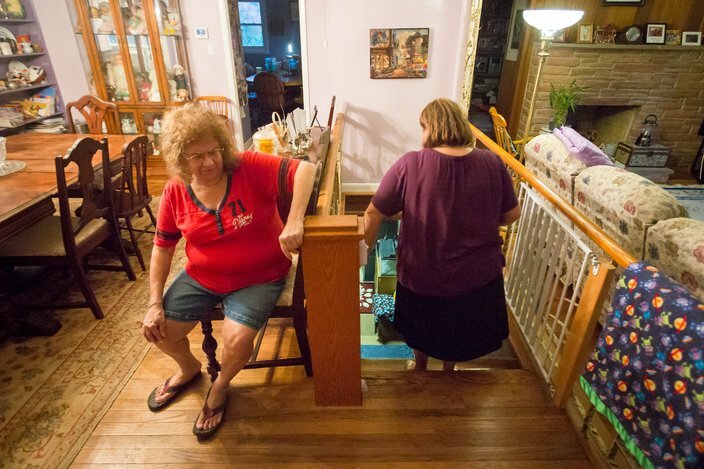 McMenamin, 56, who lives in Rutledge, Delaware County with her husband and two kids, underscored the importance of lifting the stigma of chronic pain so more people can understand the truly debilitating nature of the condition. Rossi has also faced judgment from people who look at her and don’t see a disability. She and McMenamin hope that sharing their stories will let others living with CRPS know that they are not alone. Lora Rossi has set up a GoFundMe page to raise $4,500 for her initial round of ketamine treatments. You can make a donation here.